Universal Kwik-Switch 804834 400 Series quick change. Universal Eng. 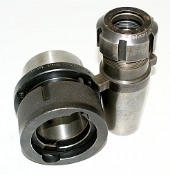 model 805663 which has a 3" diameter straight shank with 4" ring for securing. Universal Eng. 80417 with Acura-Flex 9400021 closing nut. Everything is well maintained, not sure if it was ever mounted or used.